Sprint Zagato 10126*00207, 00120*00634 (probably original), Body 634. This amazing piece of functional art is available now from the good folks at Fantasy Junction for a mere $585,000. With a generally accepted production run of 44 examples, the second series Giulietta Sprint Zagato, colloquially known as the Coda Tronca for practical reasons, is the third of what I imagine being four time-lapse frames. Frame one is the original run of Sprint Veloce Zagato one-offs that inspired frame two: the first series Sprint Zagato Coda Tonda. Frame three is the series represented by this car, and frame four is the Straight out of science-fiction Tubolare Zagato or TZ if you’re the sort to worry about pronouncing foreign words correctly. I suppose frame five would be the Tipo 33, but that fellow is its own can of beautiful worms with quite a few interesting permutations to explore. 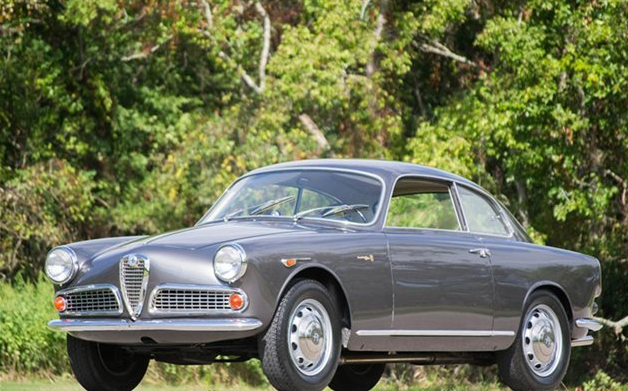 Behold: the rarest production Giulietta by production number – and also my personal favorite. I doubt I will ever own one, or even drive one for that matter, but aspirations being necessary for a healthy human brain and work ethic, I’ll set my sights here. A regular Giulietta Sprint looks BIG next to one of these. 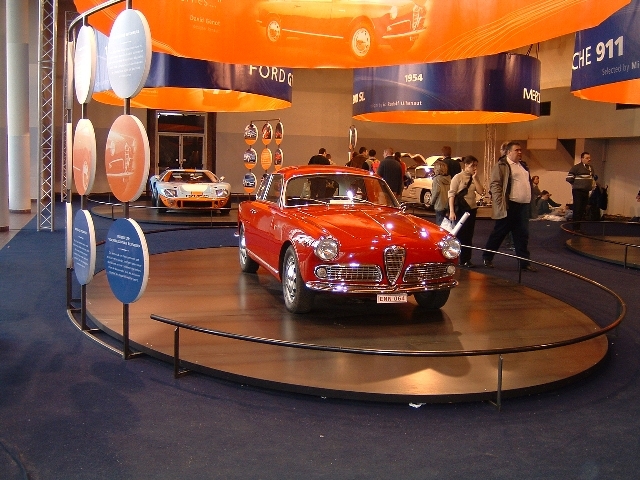 Giulietta Sprint 10102 1493*22219, 1315*013171. 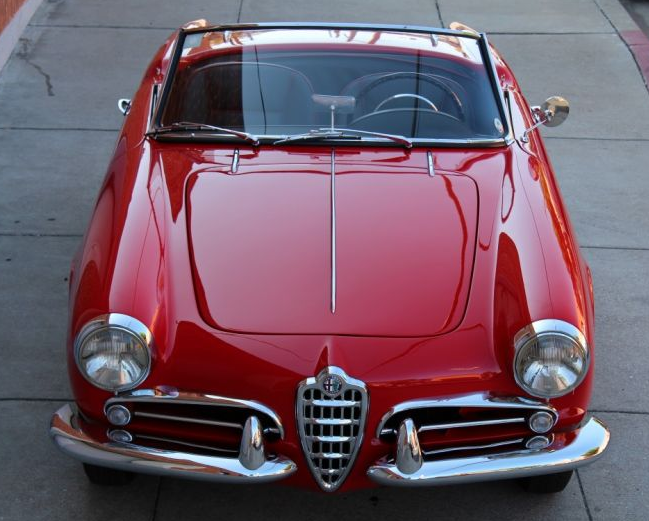 This European market Giulietta Sprint was reportedly purchased from Joe Mora in 2013 by an Alfa enthusiast in Chicagoland area. As purchased, the car had original but weathered paint and being somewhat of a perfectionist, the new owner decided to see what was under it. As shown by work in progress pictures on the B&L website, this looks to be a truly rust free example. Story goes it was originally sold to a (one hopes) very stylish woman in Venice, where it stayed until 1982 when it was shipped to the USA. The interior features new carpets and fresh vinyl. Headliner, dash, engine and rear end have never been apart. This is a fine example and rarely does one find such an unmolested car at any price. Great paint and exceptional chrome. Very good symmetry between all the pieces. Interesting to see an original Italian front license plate frame. Update October 2 2015: I took the day off work to do some really fun stuff like go to a Dr. appointment and get my daily VW oil changed and smogged, and I was rolling by FJ and thought – hey, why not, and stopped in. I gotta say, this car is REALLY nice in person. Spencer told me it looks like it’s probably sold, but like Indiana Jones, in the opening of Raiders of the Lost Ark, you could probably swoop in and grab your hat before the door gets all the way down. Commendable restoration for sure. If you licked it, it might taste like cherry or watermelon jolly rancher candy. Giulietta Spider Veloce 750F 1495*01970, 1315*32969. This car is available from Fantasy Junction in Emeryville Ca for $145,000. 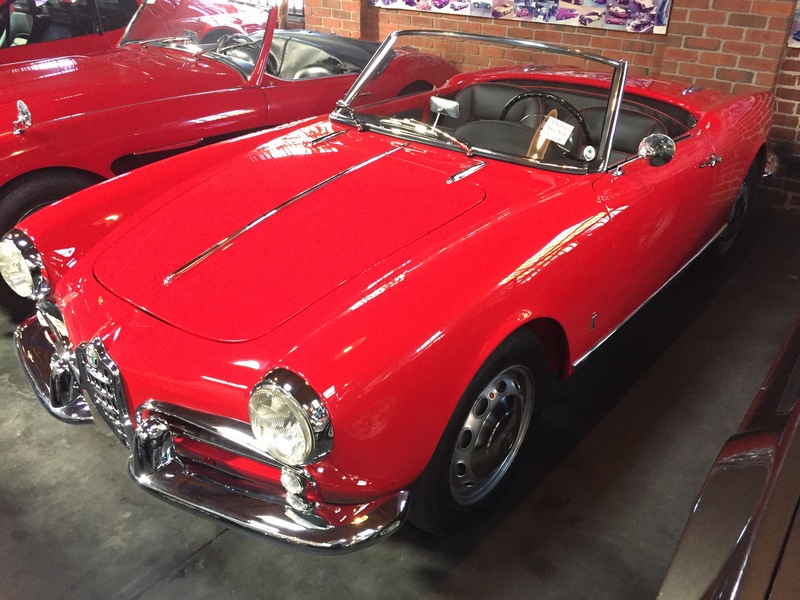 I get asked most often if I know of any 1957 Spider Veloce’s for sale – well, here is one! Car looks very well restored, though I’m sure there is one or two of you right now seething at some incorrect minutiae. The engine number is not in the correct range (1315*30267 – 30761) for this year car, but as I commented* on my “What year…” post (see below), Veloce engines blew up and were replaced. This old post has a discussion of what it may mean. The restorer did us a favor and stamped a new build plate with the number for the engine in the car – that won’t cause any confusion in 50 years. Looking good – has that wet lollipop sheen that somehow triggers heightened desire. I have worked on a lot of these cars, I can tell you it is an astonishing amount of work to get to this point from a bare shell in need of rust repair (not saying this needed rust repair – just that its a ton of work to get a car together from a shell to yum). Update 1/20/2014: This car found its way to Texas and recently sold through Driversource for about $45,000. Still a nice looking example. This car was priced a bit on the high side back in 2009 or the market hasn’t moved much I guess. I’ll split the difference. A great color for Sprints I think. 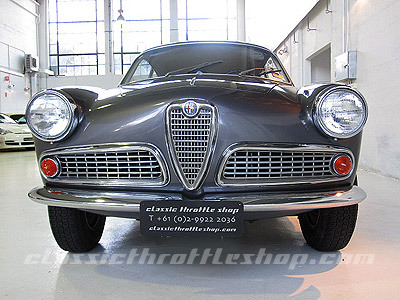 10/21/2009: Giulietta Sprint 750B 1493*06979, 1315*06197. Frank sent me an email pointing out this car for sale at Classic Throttle Shop in Sydney Australia (who also has a VERY charming Fiat 850 panel van.). Asking price for this Sprint is AUD$43,995 or a little over $40,000 US. A high price, but a very nice car. Nothing to fault here. Grills, headlight rings, lenses, bumper etc all look very nice. A pair of period Carello headlamps would be the finishing touch, but Australia might have ordinances about headlight brightness that they actually enforce. I have the wipers set that high on my windshield and they move around and chatter at speed, they need to be just at the edge of the windshield gasket on the up side of the free play since the 60 – 80 mph winds they will encounter while working will keep them at that position. Repositioning mine is like job 1142 on my list of things to do. 5/8/2013: This feller has popped up for sale at Bonhams at their up coming Spa Auction. Estimate is $53,000 – $66,000. Probably a bit on the low side. Five years later and no new pictures. Thanks Jerry for pointing this sale out to me. 6/10/2008: Giulietta Sprint Veloce 750 AR1493E08721, Engine 1315*32399. Listed for sale on Classic Driverfor 31,200 GBP, or about $61,000. The ad text says it is a 1958 Confortevole but Fusi lists the chassis number range for 1958 ending with 07921 though there is a typo where the page breaks for the 1959 year information and beside the 1959 750 designation Sprint Veloce’s it says 1958. Conforevole’s end with car 06611 so its a stretch of the accepted definitions to call it one. In this condition and at this price I don’t think they added any premium for calling it a Confortevole and I doubt there is any dishonesty at work, likely just a lack of solid information combined with the usual regurgitation of hear-say. “Perfect in all respects.” This is a car that the seller means for potential buyers to come see in person, and who in their right mind would buy a car at the absolute top of the market without viewing it in person and taking it for a spirited drive. I want to go see it just to get a better look at the sellers facilities. This presentation is great. More museum than Classic car dealership with period pictures and statistics built into the display. You probably have to qualify to even step into the ring for a closer look.